A local Act of 1764 established the Loes and Wilford Hundred Incorporation, one of ten rural Suffolk incorporations set up in the mid-eighteenth century. The Incorporation, which comprised 33 parishes, built a "House of Industry" at Melton at a cost of about £9,200. According to a parliamentary report of 1776, the buildings comprised "a chapel, a mansion house, and also of dwelling, and working rooms for the poor, a pesthouse, brewhouse, washhouse, millhouse, and other outhouses". The main building was a H-shaped two-storey structure constructed in red brick. The inmates of the workhouse were employed in spinning wool and in 1774 the net income from their labour was £237.15s.8d. By the 1820s, there was considerable dissatisfaction with the operation of the incorporation and its failure to produce the anticipated reductions in the poor rate for its member parishes. This had largely been brought about by the initial large debt incurred by the building of the palatial House of Industry, and also the high standards of living and medical relief it provided. Contributions to the running costs from the sale of goods and materials manufactured by the inmates also failed to live up to expectations. In 1826, the incorporation was dissolved by another local Act — 'And whereas inconvenience and the increase of expense in the management of the poor has arisen from the said establishment, without any adequate beneficial result, either to the poor themselves or to the greater number of parishes composing the incorporation'. Loes main building from the east, 2006. In 1826, the workhouse was closed and its contents auctioned off. 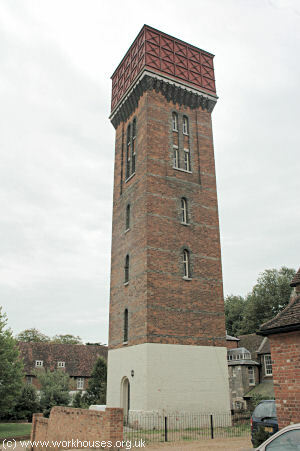 The following year, it was bought by Suffolk County for £10,000. In 1829, after alteration and enlargement of the building, it became the Suffolk County Asylum for Pauper Lunatics. Loes and Wilford former workhouse site, 1902. The western wings of the original building were extended and remodelled in 1844 under the supervision of workhouse architects Scott and Moffat. In 1862 a chapel was added, followed in 1885-6 two new blocks, laundries and a water tower. Loes main building from the west, 2006. 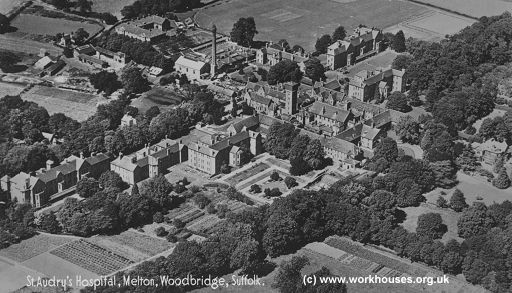 Further additions in 1902-4 included an isolation hospital, farm buildings, bakehouse, butcher's shop, stores, boiler house, mortuary, medical superintendent's house, two lodges and two terraces of houses. A large new chapel was erected in 1912. 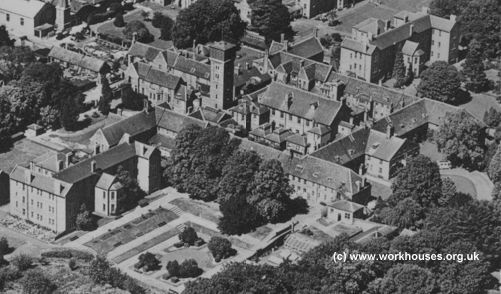 In 1916, the asylum became St Audry's Hospital. St Audrey's Hospital aerial view from the south-east. The surviving buildings have now been converted to residential accommodation. Suffolk Record Office, Gatacre Road, Ipswich IP1 2LQ. Holdings include: Minute books (1765-1826); Accounts of paupers admitted and discharged (1769-86, daybook 1791-1820); Registers of baptisms and burials (1768-1826); etc.